2) Don’t want to read the manual? 10) The tips that didn’t fit! 11) Decide that something on your newfound device annoys the crap out of you? Looking for even more in depth How To’s and Tips? Congrats! So you’ve just unboxed a new GPS watch/device? Good deal, here’s how you can get started in understanding how best to take advantage of your newfound toy. Of course, unlike that dessert you’ll eat later on tonight (or, perhaps, all day), don’t try to tackle this in one chunk. Instead, take little pieces here and there and work your way through it. And remember, in most cases, you can just get out and use the device without much knowledge. The below helps you though really take advantage of it and make it work for you. Like past years, this is a blend of new and classic posts to get you off and running. Think of it like the Charlie Brown Christmas Special that re-runs every year. So, you just finished up the statistical 3,000-5,000 calorie Christmas Day grazing – but don’t worry…I’m definitely there with you this year (we got legit American-style bacon for the day!). Assuming you’re planning on trying to work some of that off, you’ll probably be wondering how to get your Garmin to tell you how many calories you’ve burned. The good news is that the setup for calories is easy…even if the hard work outdoors or in the gym isn’t. The below article is frequently used by Garmin support folks to explain to customers how calorie burn works. For the most part, most devices from Garmin will utilize a heart rate strap for calorie burn – whether you’re indoors (gym) or outside. Thus, it’s important you setup the user profile settings to get semi-accurate data. 2) Don’t want to read the manual? Read the in-depth review instead. It probably won’t surprise many of you, but the most frequent thing I hear is that many folks actually use my reviews as their manual. Given I aim to cover every button/feature/option – it only makes sense to start there. Plus, it’s way more fun to read than the generic manual. If somehow the review post doesn’t actually cover a feature (impossible! ), then the comments section now have upwards of 1,000+ questions and answers (and even cool ideas!). Choosing your device data fields: Although written initially for Garmin devices, it applies to virtually every GPS device out there. For those who are looking for the abridged version, here’s what I do on almost all my devices: I basically have two pages, one focused on ‘lap’ metrics, and one focused on total workout metrics. So on the lap side I use: Lap Time, Lap Distance, Lap Average Pace, and current heart rate (HR). And for the totals I use total time, total distance, workout average pace, and current HR (I always just use current HR). For cycling-focused workouts I’ll add in a power-focused page and use 3-second and 30-second power. I use 3-second as my ‘instant’ power, and I use ‘30-second’ as my pacing power. P.S. – If you managed to make it outdoors into the snow, but only to ski…well…use this guide instead. A) Sport Tracks – This is free for up to two plug-ins, or $35 for the paid version. It’s downloadable to PC’s only, but has an incredible range of functionality. B) Training Peaks – I use this as my day to day training log, as it offers a good balance between usability and functionality. I can drill down pretty deep in data – but also get data from tons of other devices as well. C) Strava – If you’re looking for a competitive option, Strava is a great way to compete against real life friends and others in your area. While heavily used by cyclists, runners have a place as well there. D) Golden Cheetah– This free application is primarily targeted at cyclists, and ideal for power meter users. It’ll analyze your power data and more, to degrees you never considered possible. PC or Mac. E) Got a Mac? I’m still chugging away on the Mac options, but that post I did last year has every possible Mac option known to mankind in it. Read all the comments! F) Garmin Connect – Ironically, Garmin Connect is a really solid option for most users, even if you don’t have a Garmin device. It’ll upload from most of the popular units out there no problems (and free). There’s of course a ton more options out there, but these are my favs, mostly because they’re tried and true. As a minor side note, I do recommend that no matter which 3rd party platform you use, you should always set your device to upload a copy of the training data to the default platform. That way, in case something ever happens, you have a copy there – even if you never use it. That covers all the Garmin devices out there, and all the major tablet platforms. The 3rd Edition should be out in the new year, now that we’ve got a bunch of new devices in the past few months. Also note each review includes accuracy sections a well these days. On a Garmin device, you can use Garmin Connect to quickly create pre-formed workouts. 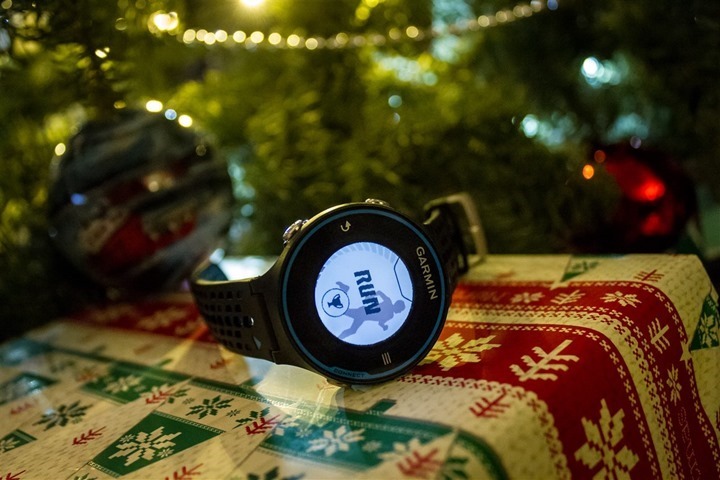 I discuss the most recent ways to do this inside my FR220 review – which applies to pretty much any Garmin device made in the last few years. Finally, every GPS user out there should read this post on understanding how race courses might differ from GPS devices. In doing so, you can also improve your times – without expending any extra effort. Really, free speed. Now, here’s the good news: If you just got a brand new Garmin device, and that Garmin was packaged after July 2013, then you’ve got the new HRM3 or HRM-Run HR strap, both of which have new firmware that dramatically reduces heart rate spikes/dropouts and/or other funkiness. If you’ve got an old device and want the new strap, you can buy it individually as well. But, I’d suggest trying the steps in the ‘Annual Public Service Announcement’ post first (or, just lick the strap…trust me). If you’re looking for Bluetooth Smart accessories, check out the end of my buyers guide from a month ago, which highlights my favorites. As we get into the new year I’ll be doing a full post just on Bluetooth Smart accessories – especially with a bunch of new ones I’ve been testing on the market like the Wahoo RPM crank-attached cadence sensor pod, and the Adidas Bluetooth Smart footpod. Feeling lucky? Waterproof immersion tests on cycling computers – how waterproof is that bike computer? 11) Decide that something on your newfound device annoys the crap out of you? Here’s how to tell them. Last year many of the companies added methods to give them your feedback directly. I really do want to reiterate again how important these methods are. I talk to all these companies at least weekly, and they truly do make decisions on these specific e-mail inboxes/forms. Sometimes the support forums/etc don’t make it to the product development teams, whereas these addresses actually go to the right places. Again, they often count simple numbers here in decision making processes – and you’d be surprised as to how low a number it takes to move the dial from no to yes. Merry Christmas, and enjoy your new toys! Found some interesting articles I hadn’t read before. Merry Christmas to you and The Girl! Merry Christmas Ray (and your family). Thanks for all the reviews!! Got my wife an edge 500 for Christmas. It somehow paired to my heart rate strap. How do I get it to unpair and then pair up with her strap.? Just do the pairing process again and connect it to her strap. To make sure that yours will not be picked up again, put yours in the microwave while you do it. The microwave is shielded and will not allow the signal to be detected. Nice list! Do you use the basic version of TrainingPeaks or the pay Premium version? I’ve played with it briefly, but Haven’t had a chance to dig into it very deep. It’s on my list of things to check out in more depth though. I note that the “how calorie measurement works” post linked to above seems to indicate that calculating calories based on kilojoules from a power meter is one of the least accurate measurement/calculation methods, ranking right down with speed/distance algorithms. Is this actually the case? I’m curious because I’m a new power meter user and I’ve noticed that my Edge 510 uses the kilojoule measurement instead of everything else if a power meter is present. No, it’s a good point. Kilojoules is a slightly different metric, that you can convert to calories – with varying results. I’ve just added a line or two to clarify that while it’s last in the list, it’s last merely because it’s not exactly calories. As always, great post, Ray. Very Merry Christmas (late) and a great and Happy new year from Canada. Happy holidays and thanks for all of the helpful information and videos in your in-depth reviews. I was fortunate to receive a Forerunner 10 for Christmas and have done a bit of research over the last several days, including reading reviews on your site, to compare its features to other GPS watches in the same price range. From the comparison chart at the end of your FR10 review, it looks like the Timex Ironman GPS Global Trainer might have more versatility for just $20 more (or so), particularly in terms of cycling features and accessories. I just wanted to see if you think there are any features/functionality issues that stand out for you as reasons to opt for the FR10. Thanks so much and happy new year! Honestly, the TGT is a different beast. Really, it’s a massive beast. At this point in time I wouldn’t go that way given the prices and where things satnd. if anywhere, I would go towards the FR310XT, which has been hovering around $170US the last little while. Thanks, Ray. I’ll consider the FR310XT, though I would like to also use this watch day to day, and it appears the 310XT might be a bit bulky for that. In terms of the FR10, I have seen multiple comments on Amazon about the watch band breaking just several months into using it – not sure if you encountered any problems with the band, but that is making me hesitate a bit before beginning to use it. I also saw the TomTom Runner GPS, which appears to be advancing in its capabilities by the day, though I have the same concern you wrote about in terms of the loose connection between the unit and the band. Lastly, though quite a bit more expensive – not sure if I want to jump up to that level – the FR220 appears to have great GPS connectivity, good features, and a more flexible structure for a better fit around the wrist. Any additional thoughts on these? Thanks! Longtime reader and Garmin 610/910 owner – but even I picked up a few things. I do have to utterly disagree with your “American style bacon” comment though; – that pork-belly poor excuse that Americans call bacon is the worst. It’s all fat. You want the nice meaty “back” bacon, the kind that the rest of the civilized world understands as bacon. That’s what we call ‘ham’. The civilized establishment of America has gotten to the point of differentiating parts of the the pig for more elaborate creations. a Software for Mac User is Rubitrack now also availible for IOS. It can sync with Garmin Connect, Suunto Movescount, RunKeeper, Withings, Fitbit ans import Data via Dropbox.